What is the difference between the corded Dremel 200-Series, 300-Series and 4000? The differences in the tools are performance and versatility. The 200-Series is the entry level dual speed Dremel multitool with which you can do basic DIY and hobby craft tasks. The 300-Series is the variable speed all-rounder and the 4000 is the top of the line high performance multitool with which you can use for the more demanding task. 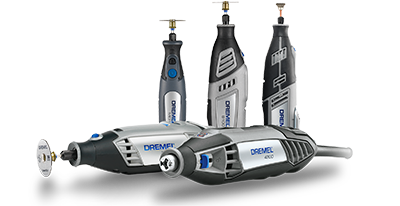 Are the Dremel 200-Series, 300-Series and 4000 compatible with all Dremel accessories and attachments? How is the Dremel 3000 different to the 300 Series? The 3000 is the next generation rotary tool. It has more power, improved handling and it comes with the innovative EZ Twist nose cap. We have integrated the wrench in the nose cap of the tool so you do not need a separate wrench anymore when changing accessories. Yes. The new EZ twist nose cap has been designed to fit all our current rotary tools. 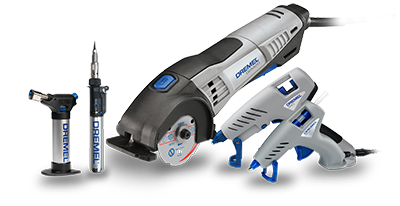 Is there a difference in the power sources of the Dremel 7700, 8000 and 8200 tools? Yes. The 7700 has a 7.2 volt rechargeable NiCd battery pack. The 8000 and 8200 both have 10.8 volt rechargeable Lithium-Ion battery packs. The advantage of Lithium-Ion batteries is that they keep their electrical charge much longer and they do not have the so called “memory effect”, so you can charge the battery whenever you want. The 8000 and 8200 both have 10.8 volts. What is the difference between the tools? Both the 8000 and 8200 have 10.8 volt Li-ion batteries. However, because the motor of the 8200 is bigger and the electronics are a bit more clever, the performance of the 8200 is higher than the 8000. Roughly, the all-round performance of the 8000 is the cordless equivalent of the corded Dremel 300-Series and the high performance 8200 is the equivalent of the corded Dremel 4000. What's the expected life of a battery? Dremel batteries will last for hundreds of charges. We do recommend that for the Dremel 7700 you run the battery down prior to recharge. Don't leave the battery in the charger constantly. Once the battery is charged, remove it from the charger. This way the battery keeps in optimal condition. There is no fixed answer to this question. The runtime of a cordless tool depends on the battery type (NiCd or Lithium-Ion), the type of application (e.g. light polishing or heavy cutting) and the tool model (Stylus, 8000 or 7700). We have designed our tools in such a way that the average battery life of each tool is matched with the most frequent type of applications for each model. What is the SpeedClic™ system? There are 2 methods of attaching accessories to the multitool: Collets: There are 4 different collet sizes (0,8 / 1,6 / 2,4 / 3,2mm). Accessory shanks have 4 different diameters that will require the use of one of the collets. Your Dremel tool will have been supplied with the 3,2mm collet. If you purchase an accessory with a smaller shank you need to also purchase the proper collet size. The collets can be purchased as a set including all collet sizes or as individual collets. Multichuck: If you have the Multichuck (4486) you don’t need to use collets, the multichuck fits all Genuine Dremel accessories with shank sizes from 0,4 up to 3,4mm. It works like a regular drill chuck and you don’t need to tighten it more than hand tight. The Versatip is used for soft soldering applications and pyrography. It’s pen-shape makes it very comfortable to use for precise jobs. It also includes more tips than the Versaflame, so it can be used for broader applications. The Versaflame is used for more general soldering work. It can be used as a soldering iron as well as an open flame stationary torch. Both tools can reach a temperature of up to 1200°C, depending on the accessory used. The difference between the 2 tools is that the Versaflame has a higher energy output, so you can heat-up more material in a shorter time. No. To lubricate your flexible shaft use regular ball bearing grease. HINT: in order to prolong the life of your tool, make sure that its flexible shaft is regularly greased. This product is no longer available at the current Dremel range.